Shopping for the best possible mattress for back pain can be an overwhelming and confusing process especially with so many options available to you. It can be a very tough process finding the perfect model that prevents nagging lower back pain. There are several key factors to keep in consideration if you suffer from back, neck, or shoulder pain and want to pcik the best model to ensure a good night’s sleep. Lower back pain is a nightly reality for many sleepers. It is crucial to find a product that offers good support so you are not suffering from added pressure to your back every time you lay down to go to sleep! It is important to note that firmness and support are not the same. A mattress can be firm without offering good support . By the same token, a soft model can give you great support. Adequate support results from a model that keeps your spine in alignment, while also remaining comfortable. Comfort and spinal alignment are equally important. If the mattress is creating pressure points on your back or elsewhere on your body, then you are likely experiencing pain and/or discomfort which negates the benefits that a mattress with good support provides. A good model should keep the spine aligned and supported while also being comfortable. What is the ideal firmness for a sleeper with this problem? Firmer mattresses “float” the sleeper more on the surface as opposed to a softer option lets you sink into it, hugging and contouring your body. Medium firm mattresses are most preferred and recommended. This means about a 5-7 on the firmness scale, with 10 being the most firm. This medium level of firmness strikes an ideal balance of necessary “push-back” type of support, while still being soft enough to offer comfort and remove pressure points on your back and body. However, there are some sleepers, especially light sleepers, that prefer softer models and feel that it is better for their back. Light sleepers typically steer away from the firmer options because they have too much of the “floating” feeling which exacerbates lower back problems. Depending on sleeping style, the softer models can provide more consistent spinal alignment, leading to less pressure and less aches. One of the most important areas back pain sufferers should pay attention to is the creation of pressure points between your body and a mattress. Typically, pressure points mean that there is more push back on one specific area, causing misalignment along your body and spine. When the back /body move out of alignment, more pressure is placed on your spine, leading to unwanted back pain. Therefore, it is important to not sleep on a model that places pressure on any of your major joints. Your body will be able to rest in a relaxed state and the pressure points along the spine and lower back will be reduced drastically. Nearly 80% of sleepers will encounter some kind of this issue in their lifetime. Not everyone is affected the same, however we all need to pay attention to them because they can become worse over time if left unaddressed. The renowned Mayo Clinic puts back pain into two primary categories , acute and chronic. It can come on suddenly, caused by a fall or heavy lifting, lasting less than six weeks (acute) or lasts more than three months and is less common than acute (chronic). A few of the primary causes of this problem and some preventative measures to help alleviate them are listed below. Stress is believed to be the most common cause of back problems. Stress causes a lack of sleep which, in turn, means more tossing and turning throughout the night. The more you toss and turn, the more likely you are to pull a muscle or to fall asleep in an unnatural position your body is not use to. It is a vicious cycle! Also, lack of sleep can leave muscles susceptible to strains. Your muscles have to work extra hard during the day when you are tired and your body has not had adequate sleep, which might lead to lower back issues. Once you have these lower back issues, the stress then circles back around , again, leading to a never ending cycle. Get enough sleep – Make sure you allocate enough time to fully rest and recover each night. Sleep is one of the most important factors affecting stress levels. Whether sitting , standing, or sleeping, it doesn’t matter. If your spine is abnormally aligned due to poor posture, lower back and back pain is more likely to occur. There are three different regions along the spine, each of which should be properly supported to help alleviate back pain as a whole. Cervical – this is the top third of your spine. This section works to support the head, which is where sleeping style and pillows come into play. Thoracic – this section makes up the middle third of your spine. The center of your spine works to support the upper body. Lumbar – This is the bottom third of your spine. The lumbar supports our lower backs and is considered the foundation of our back. Now that you know some of the causes of back problems and the criteria for evaluating mattresses including support, firmness, and pressure point relief, you can make a better choice. Choosing a model that provides ideal support and firmness, as well as reduces pressure points, is key to preventing or alleviating current or future back pain. Memory foam, latex, and hybrid coil type options that combine all of these materials are great choices for those suffering from back issues. Having a mattress with great support for the spine as well as supports it in whichever sleep position you prefer is important to ensure a pain free night’s sleep. The following models are a few of the many excellent options on the market today, and ones that can provide support and pain relief. 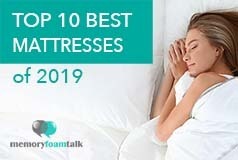 While not the only mattresses that are good for back pain, these are some good ones that we recommend and have personally slept on and have determined are good at helping you get a good night’s sleep. As I (Andrew) personally suffer from low back and neck pain, I know first-hand which ones helped reduce it when trying to sleep and not wake up feeling aches. The Loom and Leaf doesn’t make you feel like you are sinking into foam like other mattresses, however, which is something that other lower quality models in this price range can’t promise. It provides excellent support and comfort as well as prevents pressure point aggravation on your body when sleeping so you wake up without aches and pains. At $1099, it offers a level of quality and luxury on par with mattresses costing much more. This ability to change the firmness of the mattress simply by flipping it over is a great feature for those suffering from back pain. It allows you to choose firmness depending on your physical discomfort and go from softer to firmer feel without unzipping the cover to adjust the layers. Besides this both firm and soft side are clearly marked and of different colors which significantly saves your time too. The Layla is also a classic memory foam mattress that utilizes copper infused memory foam as well as ThermoGEL in the mattress cover which helps regulate body temperature which provides a cooler sleep. The copper infused memory foam helps improve circulation and blood flow which can help with back pain when sleeping. This is a great mattress with great sleep technology including the copper foam and flippable firmness feature. It provides great support and comfort and is one of the best mattress choices if you suffer from back pain. Get the full Layla mattress review here. If you suffer from back pain and need a solution with good support as well as comfort, the Nectar Sleep is a great choice. You can get it for a very affordable price, especially with our $125 off coupon. The Nectar is made up of 4 layers of foam and with a Tencel top cover that keeps your sleeping area breathable, cool, and bug-resistant. It uses semi-open LUSH foam that gives it that extra softness, loft, and breathability as it does a great job in heat absorption and redistribution. It provides a great support with the addition of a soft pillow top which provides comfort which is important for those suffering from back pain. It has that perfect firmness which provides the right contour and support needed especially for those with spinal alignment issues and back pain. This helps ease numbness and pain with adequate comfort and support, and is one of our top picks for this category. Trust me, I have several slipped discs in my neck and back and have degenerative disc disease and the Nectar helps me sleep pain free every night. 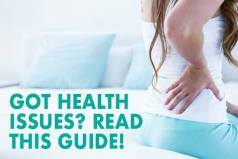 We hope that the information above helps you understand the causes of back pain and what to look for when shopping for the best mattress. Ensuring that your mattress has good support, the right firmness level, and relieves pressure points are key to making sure it isn’t a source of pain during the night. As both Kaye and I suffer from back and shoulder/ neck pain ourselves, we make sure to evaluate all mattresses that we test to make sure they don’t make our pain worse. The preceding 3 models we feel are some of the best for those suffering from back pain, but there are many others that do as well. Just follow our recommendations and criteria and apply those to whatever mattress you are looking for. 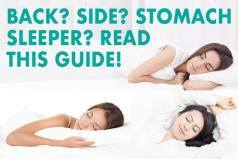 We hope this guide helps you select your next mattress, and hope that you can achieve pain-free sleep as well! Drop us a line if you have any questions or need recommendations.